The FHWA final rule for the National Performance Management Measures: Highway Safety Improvement Program (Safety PM) and Highway Safety Improvement Program (HSIP) were published in the Federal Register (81 FR 13881 and 81 FR 13722) on March 15, 2016 and became effective on April 14, 2016. These final rules are the first in a series of three rulemakings that together establishes a set of performance measures for State Departments of Transportation (State DOTs) and MPOs to use as required by MAP-21 and the FAST Act. The Safety PM Final Rule, also referred to as PM 1, supports the HSIP, as it establishes safety performance measure requirements for carrying out the HSIP and to assess fatalities and serious injuries on all public roads. Once notified of the state targets, MPOs and RPOs must either choose to adopt the state’s performance targets and support the state’s efforts in achieving those targets or establish their own quantifiable performance targets. The MPO’s decision will be communicated to PennDOT within 180 days of August 31 each year. Despite a recent spike in fatalities in 2015, the HATS region is currently seeing an overall downward trend in the number of fatalities with a 2018 target of 59 fatalities. With a 2018 target fatal crash rate at 0.965, the HATS region is also seeing a gradual downward trend in fatal crashes per 100 million vehicle miles traveled (VMT). PennDOT and HATS will coordinate annually in tracking this performance measure and ensure the regional TIP, the STIP, and RTP are developed and managed to support progress toward the achievement of these targets. In addition, coordination will continue on an ongoing bases during the development of corridor safety studies and implementation projects described in the plan. The FHWA final rule for the National Performance Management Measures; Assessing Pavement Condition for the National Highway Performance Program and Bridge was published in the Federal Register (82 FR 5886) on January 18, 2017 and became effective on February 17, 2017. This final rule establishes a set of performance measures for State Departments of Transportation (State DOTs) and MPOs to use as required by MAP-21 and the FAST Act. The final rule established performance measures for all State DOTs to use to use to carry out the National Highway Performance Program (NHPP) and to assess the condition of the following: Pavements on the National Highway System (NHS) (excluding the Interstate System), bridges carrying the NHS which includes on- and off-ramps connected to the NHS, and pavements on the Interstate System. The NHPP is a core Federal-aid highway program that provides support for the condition and performance of the NHS and the construction of new facilities on the NHS. The NHPP also ensures that investments of Federal-aid funds in highway construction are directed to support progress toward the achievement of performance targets established in a State's transportation asset management plan (TAMP) for the NHS. This final rule establishes regulations for the new performance aspects of the NHPP that address measures, targets, and reporting. % of NHS bridges by deck area classified in Poor condition. As with the safety measures, PennDOT and HATS will coordinate annually in tracking this performance measure and ensure the regional TIP, the STIP, and the RTP are developed and managed to support progress toward achievement of these targets. The FHWA final rule for the National Performance Management Measures; Assessing Performance of the National Highway System, Freight Movement on the Interstate System, and Congestion Mitigation and Air Quality Improvement Program was published in the Federal Register (82 FR 5970) on January 18, 2017 and became effective on May 20, 2017. The final rule is the third in a series of three related rulemakings that together establishes a set of performance measures for State DOTs and MPOs to use as required by MAP-21 and the FAST Act. The measures in this final rule will be used by State DOTs and MPOs to assess the performance of the Interstate and non-Interstate National Highway System (NHS) for the purpose of carrying out the National Highway Performance Program (NHPP); to assess freight movement on the Interstate System; and to asses traffic congestion and on-road mobile source emissions for the purpose of carrying out the Congestion Mitigation and Air Quality (CMAQ) Improvement Program. On-Road Mobile Source Emissions Reduction for CMAQ-funded Projects. For the three reliability measures, PennDOT has set statewide targets and MPO baseline reliability measures have been provided for informational purposes. While the Philadelphia and Pittsburgh areas are required to have annual peak hour excessive delay and non-SOV travel measures in the first performance cycle, HATS will move forward with the expectation of being added in the future for these measures. The mobile source emission reduction measures are produced for each MPO that is in a non-attainment or maintenance area in accordance with the National Ambient Air Quality Standards. HATS is a non-attainment area for PM 2.5 and has targets set for this. 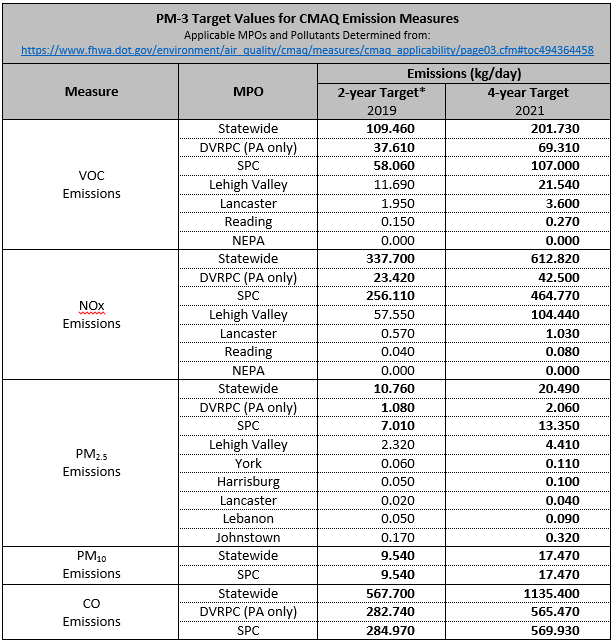 * 2-year emission targets are only applicable for SPC, DVRPC and Statewide targets (bold above). MPOs with populations <1 million are not required to report 2-year emission targets. The values were used to establish statewide 2-year targets. 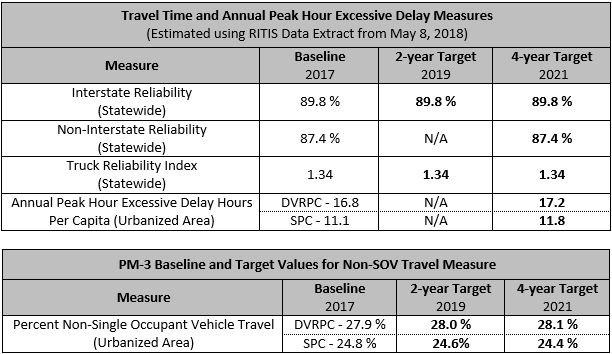 As with the other defined measures, PennDOT and HATS will coordinate regularly in tracking this performance measure and ensure the regional TIP, the STIP, and the RTP are developed and managed to support progress toward achievement of these targets.